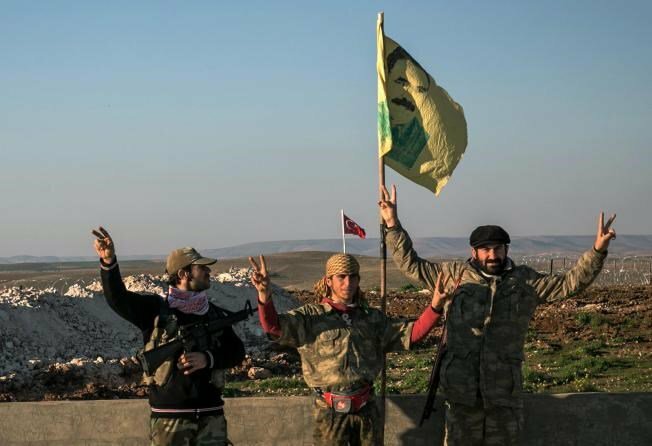 In this Sunday, Feb. 22, 2015, file photo, Syrian Kurdish militia members of YPG make a V-sign next to poster of Abdullah Ocalan, jailed Kurdish rebel leader, and a Turkish army tank in the background in Esme village in Aleppo province, Syria. Turkish jets struck camps belonging to Kurdish militants in northern Iraq Friday and Saturday in what were the first strikes since a peace deal was announced in 2013. The strikes in Iraq targeted the Kurdistan Workers' Party, or PKK, whose affiliates have been effective in battling the Islamic State group. The Kurds of Syria and Iraq have become a major part of the war against the Islamic State group, with Kurdish populations in both countries threatened by the militants' advance. Syrian, Iraqi and Turkish Kurds took part in cross-border operations to help rescue tens of thousands of displaced people from the minority Yazidi group from Iraq's Shingal Mountain in August last year and they continue to fight in cooperation with one another against the Islamic State group in areas along the Iraq-Syria border. They have been somewhat effective in limiting the expansion of the Islamic State militants across northern Iraq but there are concerns that Turkish airstrikes on the PKK could jeopardize Kurdish positions. The Kurds are an ethnic group with their own language and customs whose nomadic past led to their modern-day dispersal across several countries, mostly Turkey, Iraq, Syria, Iran and Armenia. Sunni Muslims make up the vast majority, but there is a sizeable Shiite population, particularly in Iran. After the collapse of the Ottoman and Qajar empires and the subsequent creation of these modern states, Iraq, Iran and Turkey each agreed to oppose the creation of an independent Kurdistan, making them the largest stateless minority group in the world. With nearly 25 million people living in five countries, they continue to push for self-rule. WHAT IS THEIR ROLE IN TURKEY? Turkey is home to an estimated 15 million Kurds, about one-fifth of the country's population of 76 million. Most are Sunni Muslim. The PKK has fought a three-decade war, initially for independence and later for autonomy and greater rights for Kurds. The conflict with the PKK has killed tens of thousands of people since 1984. Turkey and its US and European allies consider the PKK — which has Marxist origins — a terrorist organization for killing civilians in urban bombings. In 2012, Turkey launched secret talks with the PKK's imprisoned leader, Abdullah Ocalan, to end the conflict. The talks were made public in 2013 and the PKK declared a cease-fire a few months later. Kurds accused Turkey of not doing enough to help Syrian Kurds during the battle against Islamic State militants over the Syrian Kurdish border town of Kobani, prompting violent clashes and straining the fragile peace process. Tensions flared again after an Islamic State suicide bombing in the southeastern Turkish city of Suruc on Monday killed 32 people. Kurdish groups held the Turkish government responsible, saying it had not been aggressive in battling the Islamic State group. Turkey's pro-Kurdish party, the People's Democratic Party, said the strikes on the PKK in Syria and Iraq amounted to an end of the two-year-old truce. It called on the government to end the bombing campaign and resume a dialogue with the Kurds. Turkey views Kurds in Iraq as an ally but is suspicious of Syrian Kurds who are affiliated with the PKK. Ankara is worried that Kurdish gains in Iraq and in Syria will encourage the aspirations of its own Kurdish population. WHERE DO THEY STAND IN IRAQ? Five million Kurds have their own government in Iraq's semi-autonomous north and have significant representation in the central government with several key posts including the presidency, which is allocated to Kurds. They currently represent about 20 percent of Iraq's population, making them the largest ethnic minority. There are two main Iraqi Kurdish factions: The Kurdistan Democratic Party is led by Kurdish Regional Government President Massoud Barzani, and the Patriotic Union of Kurdistan is led by former Iraqi President Jalal Talabani. The factions fought a bloody war for power over northern Iraq in the mid-1990s, before agreeing to a power-sharing deal that ended the fighting in 1998. The Iraqi Kurdish militia, known as the peshmerga, has been a major force in repelling the Islamic State group's onslaught in recent months, with nearly a dozen countries rushing to its aid with weapons and training in the absence of genuine support from a strained Iraqi military. The United States has been one of the most ardent protectors of Iraqi Kurds for over a generation, helping establish and enforce a safe haven in northern Iraq to protect them from Saddam Hussein. After the U.S.-led 2003 invasion of Iraq, U.S. officials sought to give equal power to Kurdish politicians even in navigating the delicate rivalry between the factions. WHERE DO THE KURDS STAND IN SYRIA? Kurds are the largest ethnic minority in Syria, making up more than 10 percent of the country's pre-war population of 23 million people. They are centered mostly in the impoverished northeastern province of Hassakeh, wedged between the borders of Turkey and Iraq. The Kurdish Democratic Union party, or PYD, is the most powerful political force among Syria's Kurds. The party is a deeply secular, and affiliated with the PKK. The People's Protection Units, known by its Kurdish acronym YPG, is the main Kurdish fighting force in Syria. Since Syria's civil war began, the Kurds have made unprecedented gains, strengthening their hold on the far northeast reaches of the country and carving out territory where they declared their own civil administration in areas under their control. They have demonstrated a surprising resilience in their fight against Islamic State group militants in Kobani, pushing them out in January with the help of US-led airstrikes. More recently last month, they ejected the Islamic State group from their stronghold of Tal Abyad along the border with Turkey, robbing the ISIS of a key avenue for smuggling oil and foreign fighters. Αναρτήθηκε από mikres-ekdoseis στις 8:27 π.μ.